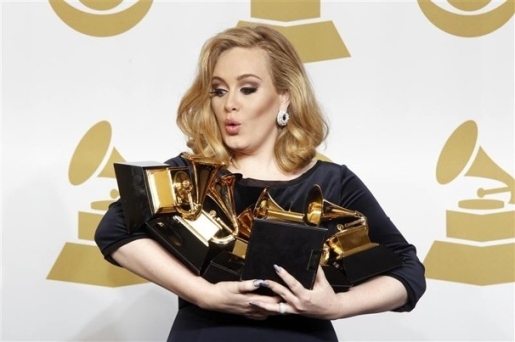 Adele won pretty much every possible Grammy in 2012. Well, last night’s Grammys may as well have been called the Adele Awards As Hosted by LL Cool J. Adele, aka Adele Adkins, was basically the only person everyone was talking about last night at the Grammys. The British songbird, who is only 23, won basically every award she was up for last night. Adele won Album of the Year, Record of the Year, Song of the Year, Pop Vocal Performance, and Pop Vocal Album. Basically, if Adele was nominated, Adele won. Here’s the complete list of 2012 Grammy winners. On the rock side, the Foo Fighters were the Adeles of the guitar. The Foo won four Grammys, for Rock Song, Rock Album, Rock Performance, and Hard Rock/Metal Performance. Bon Iver won for Best New Artist and Alternative Album (despite having been around since 2008), while Skrillex swept the dance categories, in spite of being passed over for performance montages by Epic Meal Time guest Deadmau5.